In July 2005, I was being driven from an assignment—an endeavor that took two cars and four heavily armed Iraqi guards—when my mother called. She asked me if I had the chance to go out with Iraqis, to wander through Baghdad. I told her that this scenario was near to impossible, if not dangerous for someone like me: tall, white, and bald. I explained that I couldn't go anywhere without armed protection; that Iraq was a land of blast walls and barbed wire fences. Her response was one of incredulousness. She had never seen any photographs or news reports illustrating what I described. I made my first image of a concrete blast wall through the window of my armored car that day. “Iraq | Perspectives I” grew immediately out of that conversation and as a response to what I felt was both the general apathy and the inability of people in the United States to comprehend life during the Iraq War. Confronted by a level of violence so high that walking on the streets to photograph was tantamount to suicidal behavior, I found myself confined to working with American soldiers, spending most of my time going on various missions in armored Humvees. My only view of Iraq was through inches-thick bulletproof windows. I wondered if Iraqis saw me through these windows. I never knew the answer to that, but I knew that they saw the monstrous convoys of Humvees coming through their neighborhoods. Some stared, some jeered, some cheered, some just went about their business, indifferent to the tons of destructive force driving by. This vantage on the Iraqi street is one rarely seen by the American public, but it is the most common point of view for U.S. soldiers. These images are not intimate—they reflect a distant and detached perspective on a country that is so empty, so desolate, on a situation so dire. The windows represent a barrier that impedes dialogue. 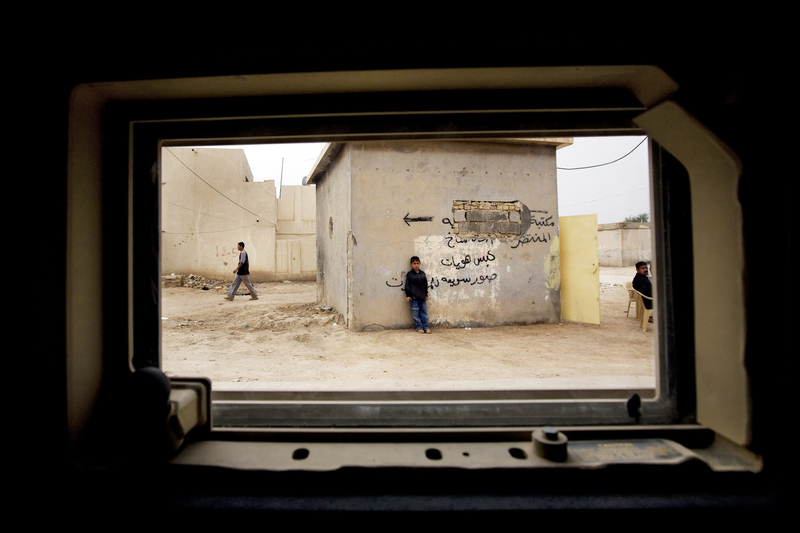 The pictures illustrate a fragment of Iraqi daily life taken by a transient passenger in a Humvee; yet they are a window to a world where work, play, tension, grief, survival, and everything in between is as familiar as the events of our own lives.